Dahlias can be prone to a number of diseases (and that’s what this is, I think). The pictures you’ve sent suggest that the stems are still green and looking healthy, so I’d rule out over – watering and consequently rot setting in. As you say you’ve been watering and feeding them so we can also probably rule out mineral deficiency of some sort. The browning of the leaves (if it’s occurred from the bottom and moved up the plant) sounds like a disease, probably fungal. The recent hot, and sometimes humid weather we’ve had is perfect for such problems. The only safe remedy is to remove the affected leaves for burning or disposal (not to compost). If there are some uninfected leaves left you might try to save the plant by watering only in the morning, so leaving the leaves dry into the night time. If the disease has spread throughout the plant (and your pictures suggest it has), I’d remove everything (including the tuberous roots and stems) and dispose as above. Ringspot- large, yellow circles appear on the leaves. This viral disease is transmitted by insects called thrips. it infects the dahlia’s roots and spreads throughout the plant. Gradually the rings on the leaves grow larger and brown spots may develop in the middle of each ring. It is not usually possible to treat the sick plant. Dahlia Mosaic- this is another root-based viral disease. It gets its name from the alternating light and dark green patches that appear on leaves. These appear because the virus causes an imbalance in the plant’s chlorophyll. Yellow leaf spots and veining are also symptoms. The infection is usually spread by aphids and once infected it is usually very difficult to treat, so once gain you need to remove the plant and burn it. Powdery Mildew – grey, fuzzy leaves that fall off is the symptom of powdery mildew. 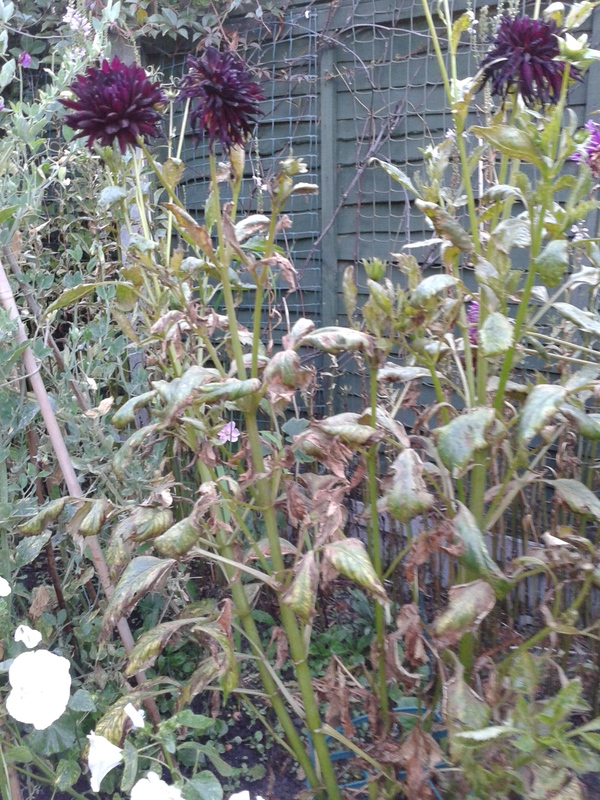 This is a fungal disease that infects dahlias when it is very humid, but it may also strike in dry weather. It is also more common in plants that are planted close together (restricting airflow). The disease can be treated with wettable sulphur once a week. Insects- thrips are small flying insects that can destroy dahlia flowers by sucking out their juice as well as brining Ringspot. They can be controlled by placing sticky traps around the plant and spraying the plant with insecticidal soap (this also works well on controlling aphids). Leaf borers can also be a problem for dahlias. These tiny worms burrow into the stem and this kills the plant. The problem can be dealt with through applying a bacteria called Bacillus thuringiensis when watering – this kills the borers, but is safe for the plant.